There is nothing more blood chilling than your baby waking abruptly screaming. As you bolt awake from a deep sleep, the thoughts racing through your mind will include what bad dream has she had now and how can I comfort her. The question is when do nightmares start and are they traumatic for your baby? Before a year of age your baby does not have language with which to label the visual images in her mind. For this reason imagination is thought to only really develop after eighteen months, when language is exploding. At this age, your toddler’s imagination can become overwhelming, as the concept of fears and boogey men arise. Your toddler may start exhibiting nightmares, which are a normal part of her development. Nightmares are part of normal sleep, occur during the light sleep phase, and are not necessarily associated with any specific emotional problem. Because your toddler is in light sleep when the nightmare occurs, she will wake easily and be able to remember what happened in her dream. You will be able to console her and re-settle her back to sleep when she is feeling better. Respond with love and cuddles when she has a nightmare. Keep a night-light on in her room, or leave a bathroom or passage light on at night. After your toddler has experienced a nightmare, she may be frightened and not want to separate from you. Keep a small mattress or some continental pillows next to your bed, so if she comes through to you after waking with a nightmare, she can sleep next to you for the rest of the night. Deal with fears of separation verbally during the day. Night terrors are different to nightmares as your child does not always wake up but screams in a terror. She may well show physical signs of physical distress such as sweating, rapid heart rate or bulging eyes. The worst part is that she may not respond to you, or be aware of anything else in the environment. This can be very disturbing to you, as a night terror may last a long time, and your child may even strike out at you when you seek to comfort her. Different from nightmares, night terrors can be seen in young babies (although the most common age of occurrence is between 2 and 5 years old) as they are not due to imagination and therefore not dependant on language development. Night terrors are not bad dreams, and actually occur when she is sleeping deeply. They usually occur within the first part of the night, within 1 – 3 hours after she has fallen asleep. At the end of her deep sleep cycle (as she enters REM sleep), one part of her brain wakes up, but another stays in a deep sleep state (this is due to an immaturity of her nervous system). This results in a ‘night terror’ when she is seemingly awake, but is actually in a deep sleep. 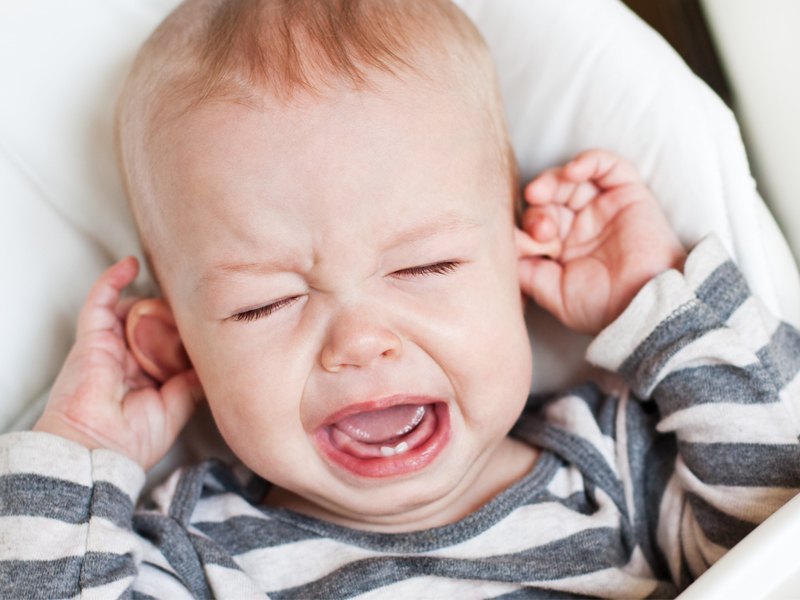 The brain is likely to associate fear with the physical symptoms of the night terror such as rapid heart rate and sweating, and this is why your child may cry and scream during an episode. In some cases high fevers can cause night terrors due to disruptions in the sleep cycle. Night terrors are seldom caused by psychological trauma, and most children return to sleep easily once it is over, and have no recollection of the episode the next day. There is not much you can do for your child when she is having a night terror, other than holding her tightly and reassuring her that you are there. Sometimes touching her may cause unnecessary stimulation, making it worse, so you may have to simply wait it out whilst keeping her safe. Research has shown that night terrors are common in children with abnormal sleep schedules and fatigue. By sticking to the awake times and implementing a regular day sleep and bedtime routine you can avert night terrors. If your child is experiencing night terrors, try to encourage a daytime nap, move her bedtime earlier and avoid excessive stimulation and sensory overload during the day, particularly before bedtime. If your child is experiencing frequent night terrors, it is sometimes useful to try waking her 15 minutes before you know it is going to occur ( you will have to ascertain this time by keeping a sleep diary for a few nights). Keep her fully awake for about 5 – 10 minutes, then re-settle her for the night. Do this for 7 – 8 consecutive nights, then stop waking her. The ‘fault’ in her deep sleep phase should have corrected itself by then. Nightmares and night terrors are as traumatic for you as they are for your child, respond with empathy and care and know that this phase will pass. This entry was posted in Sleep, Toddler Talk and tagged Night Wakings.